We arrived in Shell Lake on June 18. 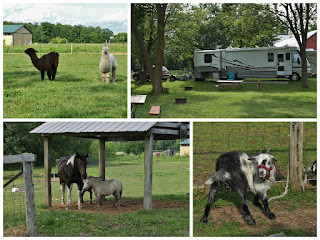 We are staying at the Red Barn Campground, owned by Dottie and Lee, who are 2nd generation owners. It is a really nice campground. Very family oriented. The grounds are very well kept up and the sites are a little bigger than average, so once again we weren't cramped in. Our site offered us a view of one of the pastures, the campground is surrounded by their farm. The pasture we could see held two horses, two ponies, two llama's and two goats. It was really quite peaceful. They have a large playground, miniature golf, and all of the animals are very people and child friendly and they encourage interaction with them. They have a beautiful red barn where they hold social gatherings. The bathrooms are older but very clean. Great personal service. The last morning of our stay the two goats got out and came for a visit. This of course sent Mielikki into a tizzy, which the goats weren't bothered by one single bit. They just kept eating the grass and nibbling on the trees. Shell Lake we need to finish up one more day trip from Iron Mountain. 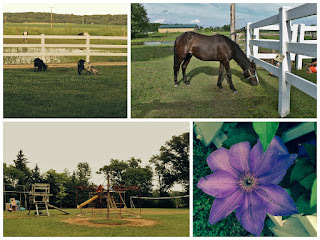 The last post was getting so long we figured we would include it in this one, after all it was a trip to Wisconsin. 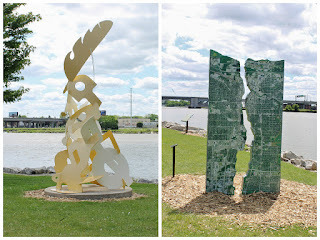 We spent one whole day exploring Green Bay and Sturgeon Bay and the peninsula. 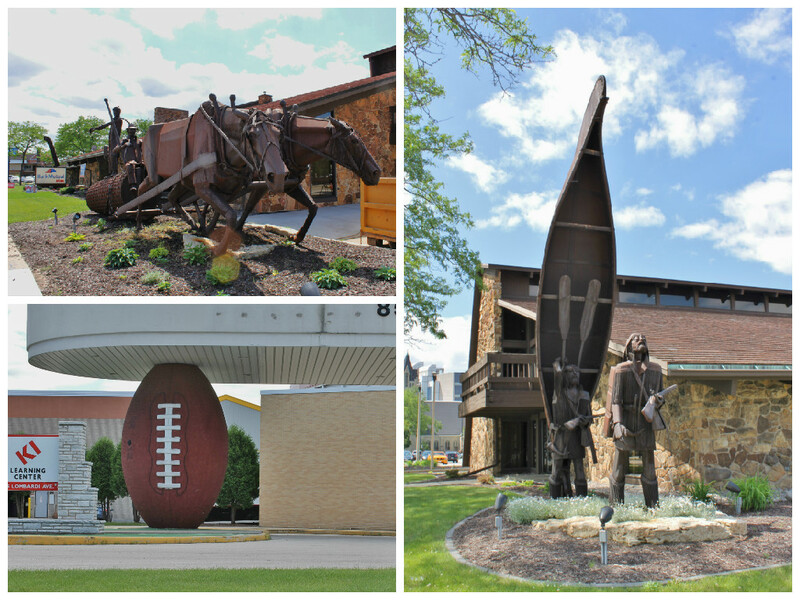 We were pleasantly surprised when we got to Green Bay. 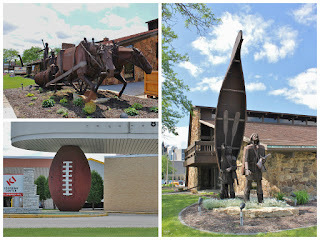 We stopped at Lambeau Field and found a few roadside oddities. 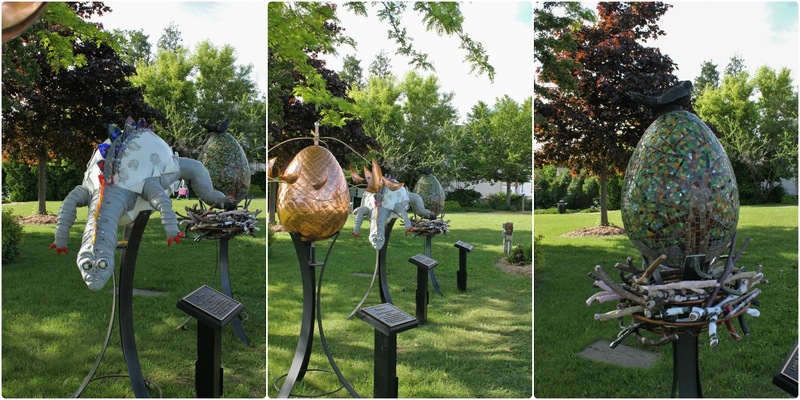 A metal sculpture of a mule team and an explorer and his canoe. The largest football is at the entrance to an arena next to Lambeau Field. The dinosaur and his pet is a random sculpture on the side of the road and we found this interesting bird while getting a shot of the dino. While crossing the Fox River we discovered there is a beautiful river walkway on the DePree side of the river. There is a lighted fish tunnel, metal fish are mounted on the walls with LED lights in them that are supposed to make it look like they are swimming, unfortunately not all the lights were working but it was still a cool little tunnel to walk through. They have large wooden lounge chairs and a number of smaller sitting areas to rest at. The walkway is lined with apartments and condos, restaurants and hotels. 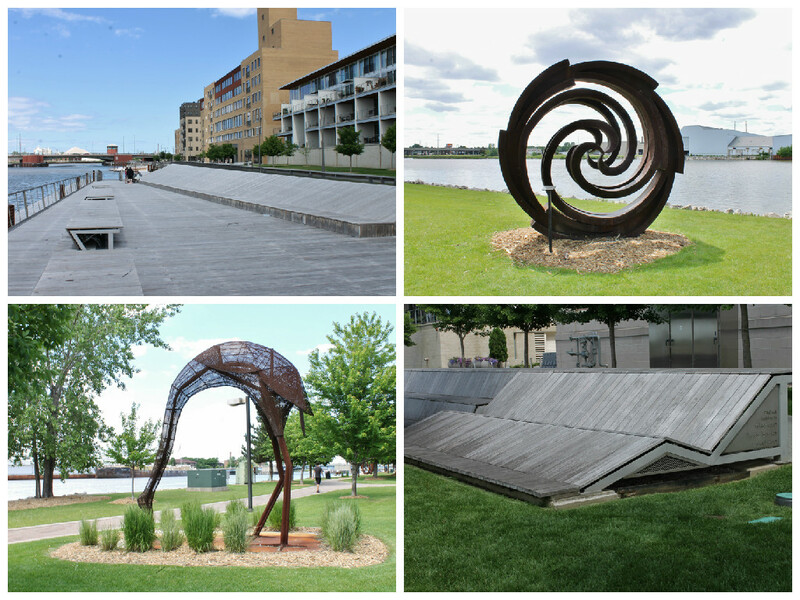 More art than you can imagine is along the walkway. This map was pretty neat, it is a detail map of both sides of the river. It looks like a giant circuit board. We headed out Hwy 57 and then took Hwy 42 up the west side of the peninsula and Hwy 57 down the east side. The east side is mostly residential but the west side is hopping with things to do and see. Each new town we drove through seemed even better than the one before, which seemed impossible. 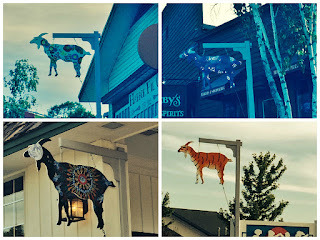 Egg Harbor was amazing and Sister Bay was a hoot with goats everywhere, real and pretend ones. 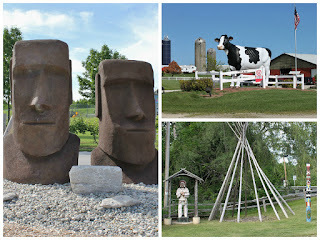 We of course found a few more roadside oddities. 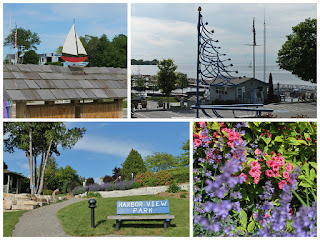 In Egg Harbor we stopped at the Harbor View Park for our picnic dinner, we had a beautiful view. While we were eating, people kept showing up with lawn chairs and picnic dinners. After about 30 people arrived we were really curious as it didn't appear anything was happening. Nancy asked one of them what they were waiting for and the response was, the concert that is being held on Thursday that we thought was today (Tuesday by the way). So they all just stayed and ate, drank and chatted. The park was beautifully landscaped and they have a number of metal wind sculptures and other art. Nicest picnic spot so far. The town has events every weekend, as did most of the towns we went through. 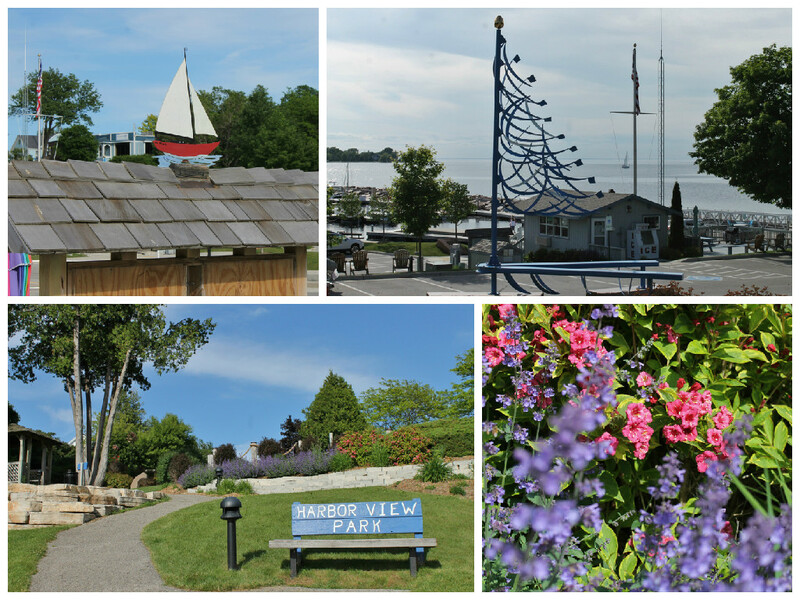 The large metal sail boat sculpture was in a perfect spot with the lake behind it, and a view of the park from the marina was so inviting. 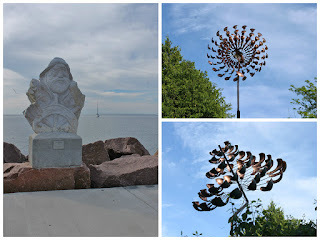 Old Salty is a sandstone carving and the wind sculptures looked like large flowers and trees. 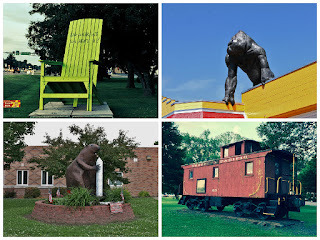 Some of the roadside oddities we found were from Roadside America and some we just happened to come across. The two Easter Island Heads are at the entry to the Harbor Ridge Winery in Egg Harbor. Cookie the Cow is at a dairy farm and when we stopped to take the picture Mielliki barked like crazy at her. The Indian and twig tepee were a random find on someones lawn. The last stop was in Sister Bay, we had found an oddity on the Roadside website that was about goats on the roof of Al Johnson's Swedish Restaurant. 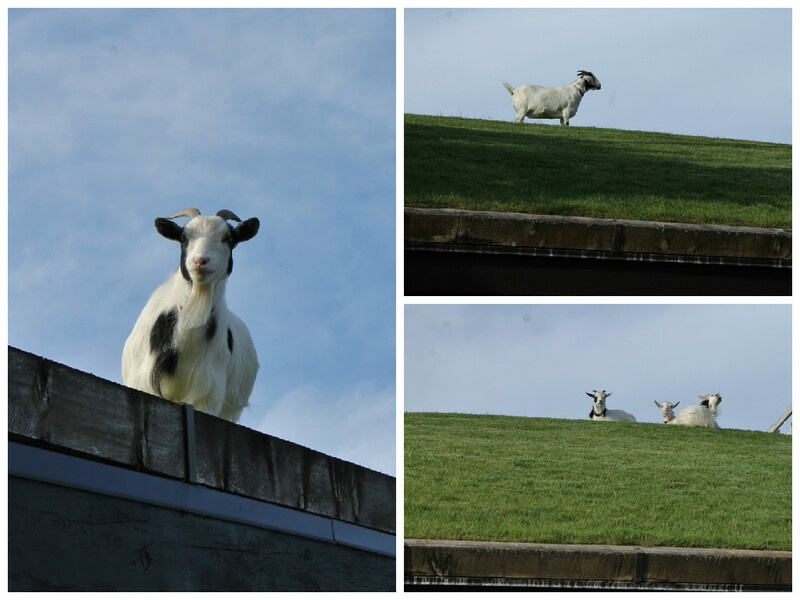 We thought they meant statues - boy were we surprised when we got there and there were real goats on a grass roof. The goats are brought in each morning from a local farm and are taken back at night. Almost every business in town has a wooden goat sign hanging out front. Would highly recommend a visit to Green Bay and a drive up the peninsula. Unless you like winter we suggest you go in the summertime. Now back to Shell Lake. First thing on our agenda was a wedding in Hudson, WI. Emily, a dear friend and former roommate of Katrina's was getting married. 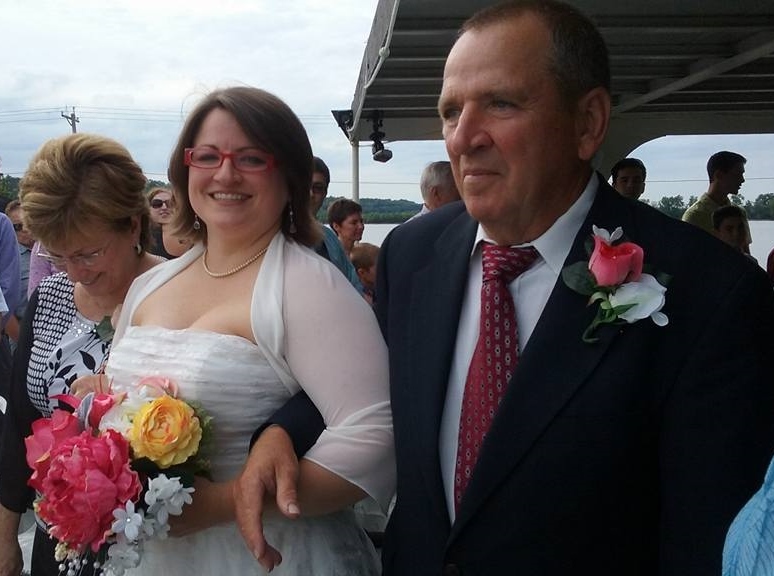 Her and Rachel got married on the Grand Duchess boat. 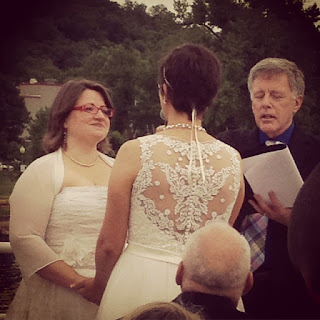 The ceremony, performed by our previous pastor, Ken Wilson took place on deck. It was a beautiful ceremony and both brides were glowing with happiness. 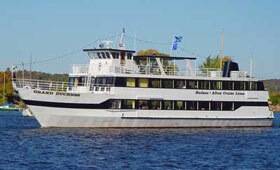 Once the ceremony was done the boat headed out onto the St. Croix River. It was a perfect evening for a cruise. We were so happy that we could share in this special day. We attended an after party at the Smiling Moose Saloon in Hudson which was great fun. We boarded Mielikki for the evening so we didn't have to worry about her being alone in the RV for 8 hours. The drive was an hour and a half one way so that made it a late night. We used Piney Ridge Kennels in Trego and we were so pleased with them. A big bonus of attending Emily and Rachel's wedding was that Katrina and Steve were there too. That meant we got to spend Saturday with them and a little bit with Tina, Steve's sister. 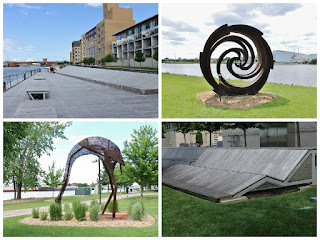 We met up in Minneapolis for the Stone Arch Music and Arts Festival. It was a large festival with over 200 artists and 5 music stages. It was fun looking at all of the art with Katrina and Steve. The festival was in the park right next to the river which was a beautiful setting. There was a great drinking fountain in the middle of the festival. The fountains were placed in a circle and each had a sign over it and in between each one was a faucet for filling your own water bottle. After the festival we went to the Surly Brewing Co. in St. Paul and met up with Tina, and Anne and Kelly, friends from Ann Arbor and Tina's friends from the area. It is one huge brewery, a large restaurant area, gift shop, and an upstairs event area. A wedding reception was happening while we were there. We had some of the best burgers we have tasted, and the fries were seasoned just right. The beer was good and they have the best names for their brews. After saying good-bye to Tina, we headed back to Minneapolis with Katrina and Steve to the Republic House to try a flight of beer there. First time I have seen a flight of beer that comes with a shot of whiskey. Sad to see the day end as it meant saying good-bye to Katrina and Steve for who knows how long. So hate good-byes. The last thing we did in Shell Lake was to find a few more oddities. Again some came from our favorite website and others we just stumbled upon. Life is Great on Hwy 8 chair is about 15 feet tall, it reminded us of Lilly Tomlin's, Edith Ann character. The Ape is on a pawn shop in Rice Lake and the Beaver resides in Cumberland. The Two Tail Fish is in downtown Shell Lake, and honestly it is kinda ugly. Nancy fell in love with this hobbit type door and plans to have one when we settle down again somewhere. The strangest thing we saw while in the area were the names of the streets. First, all the highways are letters A - Z, and each county uses the same naming system. This makes it confusing when you are looking for someplace and it's on say County Highway C but you don't know what county it is in! The best part though are the side roads, the pictures will explain. Update on our hydraulic jack issue. We didn't need to use them at this campsite so we figured we were good to go on the last day. Well, we figured wrong. When we put our living room slide in, the problem jack went down and you guessed it, it wouldn't go back up. In the process of opening the hydraulic cylinders the ends broke off two of them. Need to get this taken care of, Les had to crawl under the RV again and it had stormed all morning so he was one muddy mess. Camping World here we come. Some random things to finish this off. The campground asks for an extra $2.00 a day if you use your AC or heat. Well, two of the nights were chilly so we turned the heat on, not sure if it kicked on or not but wanted to pay for it just in case. When we went to pay, Dottie couldn't believe we had used our heat. She must have said, "really, you used your heat?" three or four times. We had to remind her we are from the south and we were cold. While driving to Portage we passed the 1/2 way point between the Equator and the North Pole in Tilden, WI. We also passed a couple of Perkins Restaurants - does anyone eat there? That's all for now, thanks for keeping up with us. - It would be advisable to bring one nice outfit with you in case you get invited to a wedding while on the road. We hit up a Salvation Army store and found dress-up clothes to wear to Emily and Rachel's wedding, so we didn't have to show up in jeans or shorts. - Have a good iron with you. We brought our travel iron and it just isn't the same. It took a while to iron Les's shirt and even longer for Nancy's dress. She bought a linen dress and shortened it, so a good iron would have made it so much easier. Our regular iron wouldn't be taking up that much more space than the travel one we brought.